Empty parking spots stare back from the deep, dark waters of the Black Sea. The absences between the fleet of robust-looking Russian ships mark a history when Ukrainian and Russian war ships were accommodated next to each other. Since 2014, however, the Ukrainian ships have been sent sailing back home from Sevastopol – a picturesque port-city in the south-western region of the Crimean peninsula where Russia has stationed its navy for the past two centuries. For Russia, the consolidation of Crimea into mainland Russian Federation is fait accompli, no matter how much Kiev, Washington or Brussels cry foul. That the deal is sealed, signed and delivered for Moscow, is evident from the massive investment in infrastructure in the peninsula through the federal Russian budget. For the first time, Crimea will also be participating in the State Duma elections scheduled for September 18. The names of five candidates to the lower house of the Russian parliament, including two high-level Crimean officials – prime minister Sergey Aksyonov and prosecutor general Natalia Poklonskaya – and Chechen leader Ramzan Kadyrov have been proposed by the Russian prime minister Dmitry Medvedev. All the major political parties of Russia including United Russia, Communist Party of the Russian Federation, Political Party LDPR, have started campaigning in Simferopol and other parts of the peninsula. 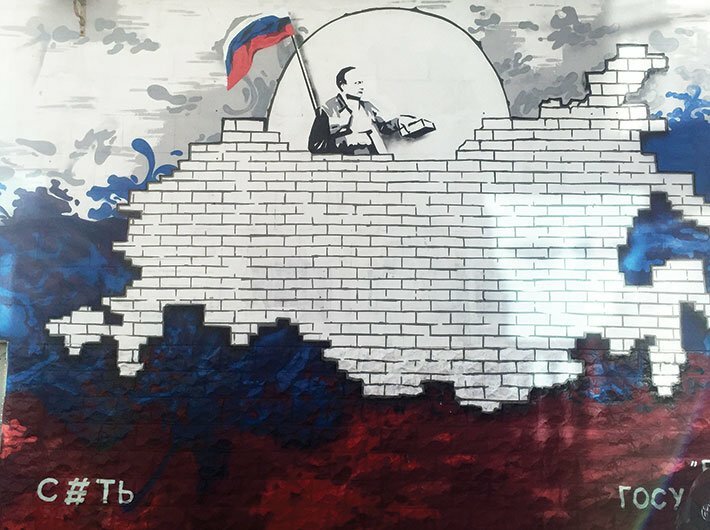 Colourful hoardings with pictures of Russian president Vladimir Putin are dotted along the highways along with foundation stones that read ‘Crimea. Russia. Forever’. There have been other symbolic consolidations as well. There are statues of “polite people” in Simferopol among other regions. The term “polite people” refers to military personnel in green uniforms without any insignia who came into Crimea a couple of months before the March 2014 turn of events and guarded the administrative buildings and airports during the annexation events in Simferopol. It was coined by Crimean blogger Boris Rozhin who reported how a Ukrainian airport security chief said that the Russian military had “politely asked” his staff to leave. The ministry of defence recently showcased a menswear collection, designed by Leonid Alexeev, of the “polite people” called Army of Russia, during a Mercedes-Benz fashion week in Moscow. According to officials from the council of state of Crimea, about $2 billion are given annually from the federal budget for the infrastructure development in Crimea compared to the previous situation of about $100 million grant from Ukraine. Between 2015 and 2020, it is estimated that about 700 billion rubles ($13.6 billion) will be spent on Crimea, including for building a bridge in the Kerch strait that will cost around 212 billion rubles. The bridge, now also known locally as Putin bridge, is opposed by Ukraine, and will extend to 19 kms when complete, making it the longest bridge in Russia and the longest of its kind in Europe. The idea is to end the relative isolation of the Black Sea peninsula and firmly entrench it as part of the wider Russian economy. Currently, Moscow can only deliver through air and sea routes, bottlenecking its economic growth. “It [the Kerch bridge] will be built by December 2018. The construction is in full swing according to schedule,” Crimean prime minister Sergey Aksyonov told this reporter. “Our predecessors understood the significance of this bridge ... and tried to complete this project a long time ago,” Putin said in a visit to Kerch in March this year. “Let’s hope we can fulfill this historical mission,” he added. Social benefits and salaries cost the Russian pocket about 88 million rubles. Apart from that, two power plants are being built in Simferopol and Sevastopol with a total capacity of 900 MW that will be completed by 2018, said Russian deputy energy minister Andrey Cherezov, after the Crimean-blackout experience of November last year. “We receive 800 MW from the mainland, 250 MW [is] generated here locally. That’s why we have enough to provide for all our needs,” Aksyonov said. However, a senior western diplomat based in Moscow, on the condition of anonymity, said that in spite of putting up a tough face, there is an economic crisis and there are not enough resources to be diverted to Crimea. “Russians promised more than they could deliver,” he said. “Sanctions have not influenced Crimea much. Sanctions only make the situation tense,” said Crimean politician Vladimir Konstatinov. According to official numbers, Crimea under Ukraine saw only about 15-20 percent of Russian tourists – the rest were from former Soviet territories like Belarus, Kazakhstan and Tajikistan. However, today 85-90 percent of the tourists are from mainland Russia and the region expects seven million tourists this year – twice as much compared to figures from before 2014. Crimea, home to about 2 million people, has about 65 percent of Russian population followed by 23 percent Ukrainians and 12 percent Crimean Tartars who are Sunni Muslims. There are 149 nationalities in total comprising Greeks, Armenians, French, Polish, Italians, etc. in very small numbers. The Crimean state council claims that all passports have already become Russian. The remaining documents, like property deeds and land titles, would be transferred under the Russian Federation by January 1, 2018. There were many reports that the Crimean Tartars were opposed to the annexation of Crimea. However, according to official data, 95.5 percent had chosen the option of annexation by Moscow, the head of the referendum commission, Mikhail Malyshev, had said after the polls and that the turnout was 83 percent. “There was no annexation. It was the free choice of the Crimean people,” Aksyonov said. “They [Crimean Tartars] are Russian citizens like other citizens. There is not a single problem with the Crimean Tartar people. According to a poll by a sociological organisation, conducted on the 4th of July , 93 percent Crimean people assess inter-ethnic relations as good and amicable,” he told this reporter on being asked whether he senses alienation among the Tartars from the current situation. However, a 20-year-old Crimean Tartar man not wishing to be named differed from the official version of the state of affairs. “We have been raised in Ukraine, educated in Ukraine, so for us Ukraine is our motherland. So people who call us ‘traitors’ are themselves traitors because they chose to betray their motherland [Ukraine],” he said. This statement also reflects differing notions of identity between the younger and the older generations – the younger Crimeans with no nostalgia for the Soviet era may find it easier to identify with the country they were raised in rather than a homeland that disintegrated 25 years back. Crimea was transferred to Ukraine from Russia – both then part of the USSR – by Soviet leader Nikita Khrushchev in 1954. However, Russia’s navy has always been stationed at the strategic port of Sevastopol under an agreement with Ukraine. Former deposed Ukrainian president Viktor Yanukovych in 2010 extended the lease on Russia’s Black Sea fleet that was due to expire in 2017 by 25 years, until 2042 at least, in exchange for lower Siberian gas prices. However, not everyone was happy with such a deal. Yanukovych’s predecessor, Viktor Yushchenko, saw the presence of Russia’s Black Sea fleet at the Sevastopol base, as an affront to Ukraine’s sovereignty and a “destabilising” factor in Crimea which is marked by a strong pro-Soviet mood. The toppling of Yanukovych in March 2014 – engineered by generous help from the West, according to Moscow – opened a can of worms. Though the original motives of Putin for the taking over of Crimea can only be speculated, there are two definite factors that triggered matters in the peninsula. First, was the constant threat of the West-backed government trying to dislodge the Russian navy from Sevastopol and thereby effectively extending NATO’s influence dangerously close to Russian borders, and second, an attempt to correct what Russia saw as a historical injustice in giving away Crimea to Ukraine. The current volatility of the situation in the region does not emanate from disgruntled citizens who wanted to stay with Ukraine but from deeply entrenched and non-negotiable postures that the international parties have adopted. “For us, it does not matter whether we are in Ukraine or Russia. Our daily lives are the same,” said an elderly Crimean Tartar woman who gave her name only as Asma. The US, the EU and Ukraine refuse to accept Crimea as a part of Russia – it was a clear breach of international law that cannot be tolerated, the parties argue. The Baltic states feel threatened with what they perceive as Russia’s revanchist ambitions. US president Barack Obama this month declared that he would be sending 1,000 more US troops to be stationed in Poland to bolster NATO’s eastern flank. The UK, Canada and Germany would also be sending in troops to Lithuania and Latvia. The July NATO meeting marked a stepping up of NATO cooperation with Sweden and Finland, neither of which are members of the NATO bloc. It shows a gradual consolidation of the western powers against Russia. Russia is not looking for war, Russian foreign ministry spokesperson Maria Zakharova told this reporter. It does seem highly unlikely that Russia would want to try to take over any of the Baltic states, in the lines of Crimea, for a variety of practical reasons. It suffers from economic crunch at the moment worsened by falling oil prices. Also, the NATO and the US defence budgets are far greater than that of Russia. So it cannot compete at a conventional-warfare level. The only threat that Russia poses is through its administration of 7,300 (this figure includes usable and not-usable stockpile as quoted by the Arms Control Association) nuclear warheads. And that is an option Russia is unlikely to use. The NATO fleet and the Russian navy are within shouting distance of each other in the Black Sea – with only 140 kms of water separating them – and within two and a half minutes of striking distance. An accident by either party could blow things out of proportion. The near collisions between Russian and the US forces in recent days and the military build-up on the Russian border have potentially disastrous consequences. If a full-blown conflict were to erupt then comparisons with a Cold War-like situation would be a gross misnomer – the war would be heated and acutely dangerous for all.